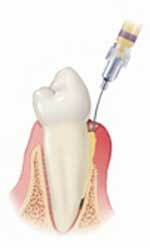 There are 2 types of therapy for periodontal disease; non-surgical and surgical. Treatment methods depend on the type and severity of the periodontal disease. Non-surgical therapy consists of scaling and root planing and is usually the first treatment of choice. 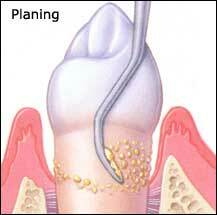 Scaling and root planing is performed to improve the overall tissue quality of the patients gingiva (gums). This cleaning is more intensive than a routine prophy-laxis, or polish that you may be accustom to having every 6 months at your general dentist. Scaling and root planing is the meticulous cleaning of the root surfaces below the gumline to remove plaque, tartar (calculus), and bacterial toxins from the deep pockets around the teeth. 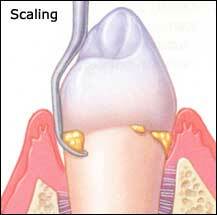 This allows the gum tissue to reattach to the tooth. The use of localized-antibiotics is sometimes utilized in addition to scaling and root planing. Dr Sutherland places this between the teeth and gums to assist in eliminating the bacteria that create the toxins and cause periodontitis. When the patient has severe periodontal disease with deep pockets (4 to 6mm or greater) between the teeth and gums, it is difficult for Dr. Sutherland to thoroughly remove the plaque, bacteria, and tartar (calculus) from the root surfaces. When this is the case, patients may need to proceed to the surgical phase of therapy to restore their periodontal health.